Officially only the first three days of Chinese New Year (February 8–10, 2016) are statutory holiday. 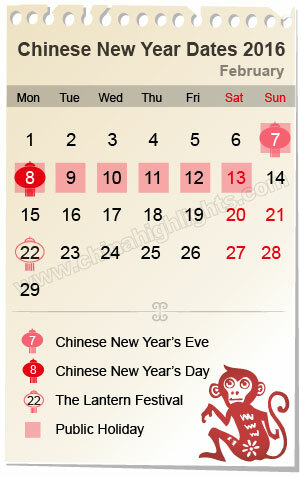 Chinese New Year's Eve and three more days are always added to give seven consecutive days of holiday. These four extra days are taken from weekends: the two weekend days closest to the statutory holiday are included, while the Saturday before (February 6, 2016) and the Sunday after (February 14, 2016) are worked. Most people will return to work on Sunday February 14 or Monday February 15 in 2016. Traditionally celebrations start much earlier than Chinese New Year's Eve. Some people start to celebrate three weeks before, the 8th day of the twelfth Chinese month (January 16, 2016; 腊八 Làbā /laa-baa/ '12th lunar month + 8'). More people celebrate from the 23rd of the twelfth lunar month (January 31, 2016). They start to clean the house to welcome a new year from then. Traditionally the end day of the Spring Festival is the fifteenth day of the first Chinese month, February 22, 2016 — the Lantern Festival. Chinese make all kinds of beautiful lanterns and eat sweet glutinous rice balls in sweet soup (汤圆 tāngyuán /taang-ywen/ 'soup round'). Chinese New Year 2016 will be a year of the Monkey. For people born in a year of the monkey (1920, 1932, 1944, 1956, 1968, 1980, 1992, 2004), 2016 is considered a bad year. See How to Avoid Bad Luck in 2016 If You're a Monkey. "Monkeys" are witty, intelligent and have a magnetic personality... Read more on the personality, career, and love suggestions for those born in Monkey years, and for other Chinese zodiac animals by clicking on the links in the table below. It was set to coincide with the slack time just before a new year of farm work begins, as a time of preparation. Traditionally most Chinese were farmers, so this made sense. Now 55% of China's population is urban (a generation ago it was 25%), but 100+ million return to their rural roots for CNY. Celebrating a New Working Year and Praying for Good "Harvests"
Lion danceLion dances are a popular Chinese New Year activity. According to China's traditional solar calendar, which dictates the lunar calendar, the first Chinese "month" is called 'start of Spring'. The farming cycle is set to start some time after this, but it really depends on the location in China. The ground doesn't thaw in some places until March. During the Spring Festival, Chinese traditionally celebrate the start of a new year of farm work, and wish for a good harvest. This has now evolved to celebrating the start of a new business year and wishing for profits and success in various vocations. There are also many legends about Chinese New Year, which attempt to provide an origin for several Chinese New Year practices. See the Top 3 Chinese New Year Legends. small shops, restaurants, and businesses will be closed for about 10 days during Chinese New year. Some supermarkets may still run during this period, but most close earlier than normal days. During the "Chinese New Year rush" (January 24th to March 3rd, 2016), you may meet some problems in booking flights, trains, and road transportation. Trains and railway stations are particularly overcrowded. 8-Day Beijing –Xi'an –Shanghai Private Tour — Our ever-popular "Golden Triangle" China tour is very doable at CNY. See more China Tours. Our tours are customizable. Tell us your interests and requirements, we will help you tailor-make a China tour.